Sexual reproduction in corals is possibly the most important process for replenishing degraded coral reefs. Most corals are “broadcast spawners” that reproduce by releasing their egg cells and sperm cells into the sea water surface. To maximize their chances of reproductive success, most coral in the Great Barrier Reef – over 130 species – spawn on the same night, during a time window that is approximately 30-60 minutes long. This is the largest-scale mass spawning event of coral in the world, and is triggered by changes in sea water temperature, tides, sunrise and sunset and by the intensity of the moonlight. How corals tune their spawning behavior with the phases of the moonlight was an unanswered question for decades. Now, Kaniewska, Alon et al. have exposed the coral Acropora millepora – which makes up part of the Great Barrier Reef – to different light treatments and sampled the corals before, during and after their spawning periods. This revealed that light causes changes to gene expression and signaling processes inside cells. These changes are specifically related to the release of egg and sperm cells, and occur only on the night of spawning. Furthermore, by exposing corals to light conditions that mimic artificial urban “light pollution”, Kaniewska, Alon et al. caused a mismatch in certain cellular signaling processes that prevented the corals from spawning. Reducing the exposure of corals to artificial lighting could therefore help to protect and regenerate coral reefs. Future work will involve comparing these results with information about a coral species from another part of the world to investigate whether there is a universal mechanism used by corals to control when they spawn. Adaptation to environmental cycles including daily, tidal, lunar, or annual cycles over millions of years, has enabled marine organisms to synchronize many aspects of their biology, thereby creating important biological rhythms for coping with a variable world (Tessmar-Raible et al., 2011). One of nature’s greatest examples of synchronized behavior is the coral spawning that occurs on the Great Barrier Reef (GBR). The ‘mass-spawning events’ on the GBR is the Earth’s largest reproduction event. During these annual events (Babcock et al., 1986; Harrison et al., 2011) changes in the intensity of moonlight trigger the spawning of more than 130 species of scleractinian corals as well as hundreds of other invertebrates over a couple of nights (Babcock et al., 1986; Harrison et al., 2011). Broadcast spawning requires coral colonies to carefully synchronize the release of egg and sperm into the water column in order to optimize fertilization success (Harrison et al., 2011; Levitan, 2005). Environmental factors, such as sea surface temperature, lunar phase and the daily light cycle, influence reproductive timing in coral and induce spawning (Babcock et al., 1986; Babcock et al., 1994; Harrison et al., 1984). However, the mechanism by which corals fine-tune and coordinate spawning remains unclear. Seasonal patterns are crucial for inducing gametogenesis and spawning in broadcast spawning species (Mendes and Woodley, 2002), where rising sea temperature is the most likely environmental driver behind the maturation of eggs and sperm (Babcock et al., 1986; Harrison et al., 1984; Oliver et al., 1988). The phase of the moon, on the other hand, coordinates the timing of mass spawning, selecting neap tides that reduce gamete dilution in the water column (Babcock et al., 1986; Babcock et al., 1994; Mendes and Woodley, 2002; Willis et al., 1985). Spawning occurs a few days after the full moon and at a precise time after sunset, although the time of day and night(s) on which spawning and gamete release occurs is highly species-specific. In addition to being influenced by moonlight (Babcock et al., 1986; Harrison et al., 1990; Glynn et al., 1991), the timing of spawning is thought to be regulated by the onset of darkness (Babcock et al., 1986), the duration of regionally calm weather (van Woesik, 2010), food availability (Fadlallah, 1981), twilight chromaticity (Sweeney et al., 2011), and salinity (Jokiel, 1985). How these exogenous factors function together with endogenous mechanisms in corals to achieve mass spawning harmonization is unknown. 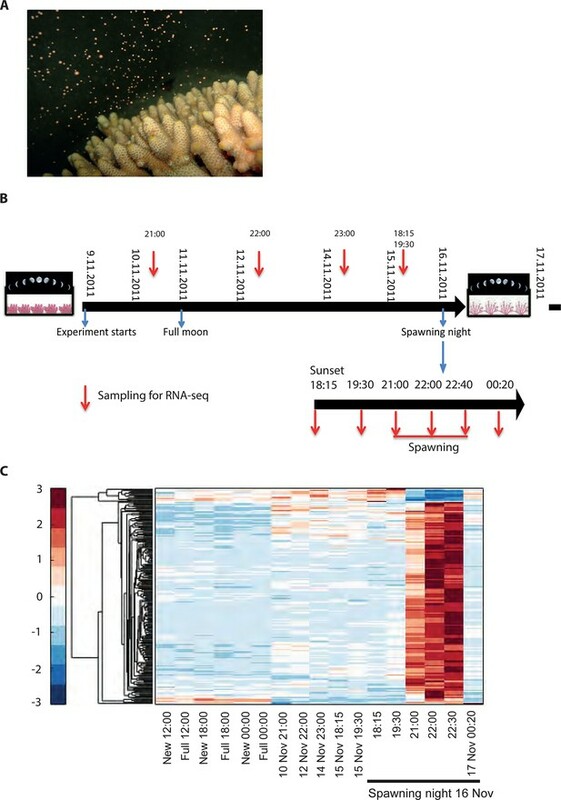 To explore the interaction of exogenous and endogenous factors, we characterized the transcriptome from 16 Acropora millepora colonies over 8 days leading up to the spawning night, as well as during and after spawning (Figure 1). These results were compared with transcriptomes of four A. millepora colonies sampled 3 months prior to the month of spawning, during full and new moon days at midday and night (12:00, 18:00 and 24:00). A comparison of new and full moon samples, when spawning did not occur, revealed changes in gene expression according to the day within the month, and relative to levels of moonlight (Figure 1—figure supplement 1, Supplementary file 1,2), thereby demonstrating a response by RNA transcription to the lunar cycle. Notably, many of the genes showing higher expression levels at midnight on full moon days compared with midnight on new moon days, were linked to rhythmic processes (circadian clock related genes) and light signalling, including cryptochrome 1, cryptochrome 2, and thyrotroph embryonic factor. Changes in gene expression during mass spawning of the coral, Acropora millepora. (A) A. millepora colony releasing gametes. (B) Schematic representing the sampling regime of coral branches from A. millepora colonies (colonies were sampled for 8 days leading up to the spawning night, during the spawning night and 1 day following the spawning event), blue arrows indicate timing of experiment start, full moon and observed spawning. Additionally, colonies were sampled prior to the November spawning month (the colonies were sampled at 12:00, 18:00 and 24:00 in August on new moon and full moon days). (C) Hierarchical clustering of A. millepora gene expression data for the 184 coral transcripts that were only variable during the spawning day using sampling points in August and November. ‘New’ and ‘Full’ denote new moon and full moon conditions, respectively. To elucidate the role of natural moonlight phases and the effect of ‘light pollution’ on mass spawning synchronization, 16 large A. millepora colonies were collected from the Heron Island reef flat (GBR, Australia) and transferred to large outdoor aquaria, which were exposed to natural sunlight, moonlight and flow-through seawater from the reef flat. Coral colonies were exposed to one of the following treatments: ambient (maintained under ambient conditions of daylight and moonlight, N=6), light (illuminated using artificial light, low intensity ~ 5 µmole quanta m-2 s-1 daily from sunset to midnight, then kept in the dark until sunrise, N=5), or dark (covered with a black shade from sunset to sunrise to block moonlight, N=5) (Figure 2A) beginning 8 days prior to the spawning night. We sampled corals from all treatments during the days leading up to the spawning event at midday, at moonrise and at hourly intervals during the spawning night after sunset; this included sampling of released gametes (Figure 1B). During the spawning night, colonies exposed to ambient conditions spawned in a similar manner to those on the reef (gametes were released at approximately 21:30–22:30); however, no sign of spawning behavior occurred in either the light or dark treatments. For ambient corals, we identified 184 transcripts that were only variable during the spawning day and showed a clear change in expression (mostly induction) just prior to and at the time of gamete release (Figure 1C); however, such changes were not observed in corals that were kept in the dark (Figure 2B). Colonies exposed to the light treatment showed a mismatch of gene expression profiles, and the expression of the genes that were highly variable during spawning occurred prematurely (around sunset at 18:15 and 19:30, Figure 2B). Moreover, these colonies did not release gametes, implying that ‘light pollution’ disrupted spawning synchronization. Gene enrichment analysis revealed that coral transcripts, which were only variable during spawning, were enriched in Gene Ontology (GO) processes of the cell cycle, GTPase activity and signal transduction (Figure 3A). An analysis of transcripts that were highly up-regulated or down-regulated during spawning showed a larger proportion of transcripts (177) that increased their expression levels during spawning (Figure 2—figure supplement 1A), a substantially smaller portion of 29 transcripts that were down-regulated (Figure 2—figure supplement 1B) and no correlation with gene expression profiles from the released gametes. Fifty four out of the 177 up-regulated genes, and none of the 29 down-regulated genes, were also found to be variable during the spawning day (Supplementary file 1). 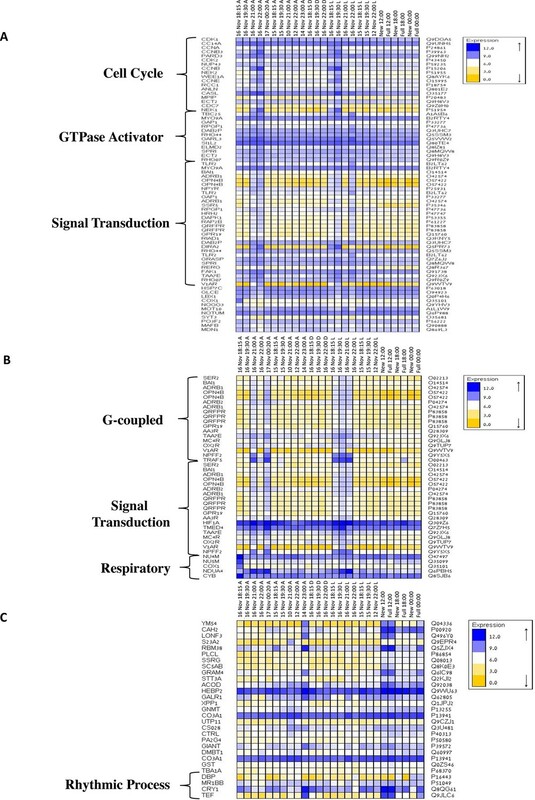 The up-regulated coral genes were enriched in G protein-coupled processes, signal transduction and respiratory processes (Figure 3B). Down-regulated genes were enriched in processes which generate and maintain rhythms in the physiology of organisms (rhythmic processes) such as circadian clock related genes (Figure 3C) and included some additional genes, which were not clustered. A qPCR validation (Supplementary file 3) of both up-regulated and down-regulated genes showed strong correlation between the qPCR and RNA-seq data based on log2 fold change measured on the spawning night in ambient conditions at 19:30 versus 22:00 (r2=0.92, p<0.0001) (Figure 2—figure supplement 2). Disrupting synchronized mass spawning in the coral, Acropora millepora. (A) Beginning 8 days prior to the spawning night, A. millepora colonies were exposed to one of the following treatments: ambient (A), in which colonies were exposed to natural day and night cycles with full exposure to moon light; light (L), in which colonies were exposed to natural daylight during the day and artificial photosynthetically active radiation (PAR) light (~5 µmol quanta m-2 s-1) at sunset every day for ~6 hrs (between 18:15 and 24:00) and then left in the dark until sunrise; or dark (D), in which colonies were exposed to natural daylight during the day and left in the dark from 18:15 to sunrise. (B) Hierarchical clustering of A. millepora gene expression data for the 184 coral transcripts that were only variable during the spawning night, depicting gene expression changes between treatments A, L and D denote ambient, light and dark treatments, respectively. Gene ontology enrichment analysis for Acropora millepora gene variability during mass spawning. Gene enrichments (false discovery rate<0.1) across GO categories are shown. GOseq was used to test for enriched GO categories of genes that were (A) variable during spawning, (B) up-regulated during spawning or (C) down-regulated during spawning. The left and right identifiers represent the gene names and UniProt accession numbers, respectively. Since corals do not have specialized visual structures, light detection is likely mediated through photosensitive molecules such as opsins or cryptochromes (Reitzel et al., 2013) that help the corals to adapt and to be synchronized with the external irradiance levels (Panda, 2002). Furthermore, specific classes of G-proteins can be activated by opsins in response to light in coral larvae (Mason et al., 2012). Neuropeptides are another diverse class of signalling molecules that act through G-protein coupled receptors. These peptides have been implicated in an array of biological processes such as reproduction, metabolism, feeding, circadian rhythms, adaptive behaviors and cognition (Grimmelikhuijzen and Hauser, 2012). The importance of neuropeptides in life phase transitions has been recorded across a range of taxa such as annelids, cnidarians, insects and mammals (Schoofs and Beets, 2013). Our results indicate that gamete release from a broadcast spawning coral is potentially controlled by a series of G-protein-coupled signalling pathways and that the trigger for release might be a non-visual ocular photoreceptor such as the melanopsin-like coral homolog and/or a range of neuropeptide candidates (Figure 4, Supplementary file 1). Genes induced during spawning included two melanopsin (opn4b)-like homologs, a battery of G-protein-coupled receptors (GPCRs), and a homolog of synaptotagmin 7 (Figure 3, Figure 4, Supplementary file 1). 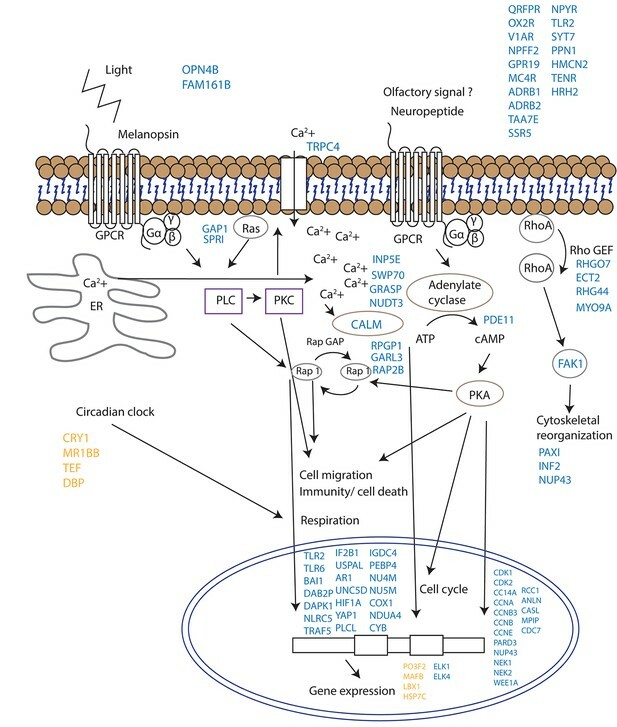 Melanopsin (Opn4) has been shown to be required for light-induced circadian phase shifting in mammals (Panda, 2002). Given the broad changes in expression patterns in GPCRs and their potential triggers, it seems that neuropeptide signalling appears to be central in controlling gamete release in broadcast coral spawning, where such a simple nervous system likely evolved in an ancestor common to all cnidarians (Grimmelikhuijzen and Hauser, 2012). Our data are consistent with the activation of GPCR receptors and consequent GPCR signalling cascades followed by changes in cell migration (eg, RAP2B, UNC5D, IF2B1), immunity/cell death (eg. TLR2, TLR6, TRAF5, DAB2P, FAK1, NLRC5) respiration (NU4M, NU5M, COX1, NDUA4, CYB) and cytoskeletal organization (eg. PAXI, INF2, NUP43) which together lead to synchronized gamete release (Figure 4). Proposed model for signalling events during spawning and gamete release in Acropora millepora. The release of gametes occurs in the presence of moonlight or another signal (such as an olfactory signal) that stimulates melanopsin-like homologs and/or other neuropeptides and commences GPCR signalling cascades upon receptor activation. This effect results in cell migration, follicle rupture, changes in immunity/cell death, respiration and cytoskeletal organization, and the combination of which results in a synchronized gamete release. Blue labels indicate genes being up-regulated; orange labels indicate genes down-regulated. Our study does not provide direct evidence as to whether the melanopsin-like homologs that are up-regulated during spawning are true photopigments, as they have been shown to be in mammals (Peirson et al., 2009). The sequential expression pattern of these melanopsin-like homologs, however, suggests that they are important for signalling events during mass spawning in corals regardless of whether they convey a light, pheromone or other signal. The discovery of potential neuropeptide/GPCR-coupled signalling mechanisms are consistent with neurohormones playing a role in synchronized spawning events in tropical abalone (York et al., 2012) and in the settlement behavior of coral larvae (Grasso et al., 2011). Additionally, an increase in a tachykinin-like peptide receptor suggests that a pheromonal trigger may be involved (Winther et al., 2006). Given that the transient receptor potential protein superfamily represents calcium permeable channels which have important roles in phototransduction in Drosophila and in mammalian vision (Panda, 2002; Pan et al., 2011), our results showing an up-regulation of Trp-related protein 4 fits with the proposed hypothesis that cytoplasmic calcium may act as a secondary messenger for coral photoreceptors (Hilton et al., 2012). Although the cues for the synchronization of gamete release in broadcast spawning corals are complex, our results indicate that nocturnal illumination is an important factor and that changes in the light regime surrounding corals can desynchronize the timing of gamete release. In this respect, only colonies exposed to ambient light conditions at night spawned. We further tested the concept of light regime changes causing a mismatch in the timing of gamete release through another experiment in which A. millepora colonies were exposed to treatments where the length of the day was extended artificially (between sunset and midnight), through exposure to a suite of light quantity and quality regimes. We found that colonies exposed to ambient conditions and treatments with light sources in the red light region (620–700 nm) of the spectrum spawned at 21:30, which was synchronous with A. millepora colonies spawning in the field. However, colonies exposed to light in the green (500–620 nm) and blue (400–500 nm) regions of the spectrum and to PAR (400–700 nm) at low-dim, medium and high light intensities phase shifted their spawning time by a 6–8 hr delay or spawned 2 nights later as compared with colonies under ambient conditions (Figure 2—figure supplement 3). Our results suggest that detection of light in the blue and green parts of the spectrum is important for gamete release, which is congruent with suggestions that blue light detection is a key element for coral spawning behavior (Gorbunov and Falkowski, 2002) and evidence that A. millepora larvae settle more readily under blue and green light as compared with red light (Strader et al., 2015). Furthermore, our results from both experiments (Figure 2, Figure 2—figure supplement 3) on the effect of ‘light pollution’ on coral spawning behavior suggest that disruption or phase shift delay in spawning time can occur rapidly, that is, within 7 days of exposure to changes in nocturnal light regimes. These findings differ from previous studies which suggested that entrainment to moonlight rhythms occurs over several months (Willis et al., 1985). Our results on the effects of light on the timing of spawning are crucial because sexual reproduction is one of the most important processes for the persistence of reefs. The interplay between endogenous clocks and external cues in an era of industrialization and global change (when artificial lights compete with moonlight to affect reproductive timing and fertilization success in broadcasting species) should be considered in plans to protect coral reefs and marine ecosystems. Twenty whole colonies of A. millepora were collected on November 9, 2011 from the Heron Island reef flat (23 33’S, 151 54’E), GBR, Australia. Small branches were cut from the central portion of each colony prior to specimen collection to confirm pink-coloured eggs, which are present when a colony is reproductively mature (Harrison et al., 1984). Four of the colonies were transported close to the shore but were left in the field on the reef flat (treatment F). The remaining 16 colonies were transferred to large, outdoor flow-through aquaria and were exposed to natural sunlight, moonlight and flow-through seawater from the reef flat. Colonies in the outside aquaria were divided into the following three treatments: ambient (A), in which the colonies (N=6) were exposed to natural day and night cycles and full exposure to moonlight; light (L), in which the colonies (N=5) were exposed to natural daylight during the day and to artificial PAR light (~5 µmol quanta m-2 s-1) post sunset every day for ~6 hrs between 18:15 and 24:00 and then left in the dark until sunrise; and dark (D), in which the colonies (N=5) were exposed to natural daylight during the day and left in the dark between 18:15 and sunrise. The experiment was conducted at Heron Island Research Station in an area that was maintained in darkness at night to avoid artificial light contamination from non-experimental sources. Branches from colonies were collected from each of the three treatments on 4 d (November 10, 12, 14, and 15, 2011) leading up to the spawning night (November 16, 2011) (Figure 2A). The corals were sampled on these days at noon and during moonrise, which was between 21:00 and 23:00 depending on the day. On November 16 (the spawning night), we sampled the corals at noon, 18:15, 19:30, 21:00, 22:00, 22:30 and 00:20. The release of gametes occurred between 21:30 and 22:30, and the colonies in the Ambient treatment began to show signs of setting at 19:30. We also sampled released gametes from colonies in the Ambient treatment. Sampled coral branches were snap-frozen in liquid nitrogen and stored at -80°C until processing for total RNA extraction. Additional branches were sampled (N=4) during August from the reef flat at a 2-m depth during new moon and full moon days at 12:00, 18:00, and 24:00. Total RNA from the coral branches was isolated by homogenizing 100 mg coral tissue in 1 ml TRIzol (Invitrogen) according to the manufacturer’s instructions. The RNA was then extracted once with 1 volume chloroform and precipitated in ½ volume isopropanol, washed in 1 volume of 75% ethanol and subsequently dissolved in RNase-free water. These samples were then processed through a 5 M LiCl precipitation overnight at −20°C, washed three times with 75% ethanol and subsequently dissolved in RNase-free water. The integrity and quality of the total RNA was assessed using a Bioanalyzer (Agilent Technology). Only the samples showing intact RNA (RNA integrity number >8) were used for the RNA-seq analysis. The Illumina TruSeq protocol was used to prepare libraries from the RNA samples. Overall, 12 libraries of full moon and new moon samples were run on one lane and 24 libraries of samples from the spawning experiment were run on two additional lanes in the Illumina HiSeq2000 machine using the multiplexing strategy of the TruSeq protocol. On average, ~10 million single-end reads were obtained for each sample of the full moon and new moon conditions, and ~15 million paired-end reads were obtained for each sample in the spawning experiment. The sequencing data reported in this study was deposited to the Sequence Read Archive (SRA), under accession SRP055723. The reads were 100 bases long. TopHat (Trapnell et al., 2009) was used to align the reads against the A. millepora genome, keeping only uniquely aligned reads with up to two mismatches per read. Only reads that were aligned to the protein coding regions of the A. millepora genes (Moya, 2012) were used. A custom script written in Perl was used to parse the output of TopHat (given in the Sequence Alignment/Map (SAM) format [http://samtools.sourceforge.net/]) and to convert it into the raw number of reads aligned to each A. millepora gene (available via Dryad data repository: doi:10.5061/dryad.541g6). The A. millepora gene information was downloaded from the NCBI database, we retained only genes that were found to be significant similar (Blastx E-value<1e-6) to the Swiss-Prot proteins data set. On average, ~40% of the reads in the full moon and new moon conditions and ~30% of the reads of the spawning conditions passed all filters and were mapped to the coding regions of the 12,384 A. millepora genes with Swiss-Prot homology. These numbers are comparable to the ones obtained by a similar analysis in a better annotated animal, the zebrafish, in which between 10% to 56% of the reads mapped to the coding regions of known genes (Ben-Moshe at al., 2014; Tovin et al., 2012). Statistically significant differences between the number of reads aligned to each A. millepora gene (the expression profile) in the tested conditions were identified as described (Alon et al., 2011). Briefly, the expression profiles were normalized using a variation of the TMM normalization method (Robinson and Oshlack, 2010). Subsequently, we searched for expression differences between samples associated with the full versus new moon conditions that could not be explained by the expected Poisson noise with a p-value <0.05 and using a Bonferroni correction for multiple testing (Alon et al., 2011). Each one of the full moon and new moon samples was sequenced twice (technical duplicates), and as the correlation between the gene’s expression levels in these duplicates was very high (average Pearson's correlation >0.999) the average expression level is presented in the figures. The data from the full moon and new moon experiments and the spawning experiment were combined and normalized as described above. We then performed a hierarchical clustering (MATLAB, MathWorks) of all of the genes that (1) had expression levels above the median of all of the gene expression levels in at least one sample and (2) had a variance in the expression level that was above the median variance of all of the genes. The gene's variance was normalized by the gene's mean expression level (the expected variance assuming Poisson noise). Overall, 4756 genes out of the original list of 12,384 genes passed these two filters and were therefore considered to be both expressed and to have an expression profile that was not constant. Clustering of the expression patterns of these genes indicates that a sizable number of genes are highly variable only on the spawning day (Figure 1—figure supplement 2). These genes are characterized and identified below. The genes that were highly variable during the spawning day in ambient light conditions (regular light-dark cycles), which ultimately led to the spawning event, could be responding to at least two factors: (1) moonlight (either directly via light or indirectly through the time of the month) or (2) the time of day. Alternatively, these genes can also be variable on other days, such as the days prior to or after the spawning day. Finally, these highly variable genes could also be part of the molecular mechanism of spawning. To identify the latter group, we selected all of the genes that were highly variable during the spawning day in ambient conditions but significantly less variable in the full moon and new moon conditions at different times of the day (without spawning events) and the days prior to the spawning events (all under ambient conditions). Variability was estimated using a gene's variance divided by its expected variance assuming Poisson noise in the gene expression levels, which is equal to the gene's mean expression level. All of the gene variability measures were sorted, and we selected genes that were in the top 10% on the spawning day (i.e., highly variable) but not in the top quartile (i.e., not as variable) in the previous days and in the full moon and new moon experiments. We noted that changing the cut-offs produced similar results, for example by selecting genes that were in the top 5–25% on the spawning day but not in the top 25–50% in the previous days and in the full moon and new moon experiments. Additionally, we pursued high top expression levels (more than 100 reads) of these genes in any one of the mentioned conditions (only one quarter of the genes showed this expression level or higher). We also identified genes with higher or lower expressions on the spawning day compared with the previous days and those of the full moon and new moon experiments. We selected for at least a twofold difference between the mean expression level on the spawning day and (A) the mean expression on the previous days, as well as (B) the mean expression in the full moon and new moon experiments. Thus, the difference in expression level had to be at least twofold in respect to both (A) and (B). Additionally, we filtered for greater than 100 reads in the top expression level in the higher condition. The genes detected were analyzed using the software GOseq (Young et al., 2010) to find statistically significant over-represented functional groups with a Benjamini-Hochberg false discovery rate equal to or less than 0.1. We compared the gene's expression pattern in the described conditions with the expression pattern of the released gametes that were sequenced, and found no significant correlation between the gene's expression patterns (average Pearson's correlation of 0.22 between the released gametes and all the other described conditions). Specifically, for the genes detected above as having higher or lower expression on the spawning day, the correlation with the released gametes sample was even lower (average Pearson's correlation of 0.05 between the released gametes and all the spawning day conditions). The expression patterns of the RNA-seq data for selected genes with variable expressions during spawning (Supplementary file 1) were validated via quantitative PCR (qPCR). Primers were designed from RNA-seq data using the Primer Express Software v3.0 (Applied Biosystems, USA). Total RNA (1000 ng) was reverse transcribed with a SuperScript VILO cDNA Synthesis Kit (Invitrogen) following the manufacturer’s instructions. Transcript levels were determined via qPCR assays using an Eppendorf 5075 (Applied Biosystems, USA) robot to dispense SYBR Green PCR master mix (Applied Biosystems, UK) into 384-well plates, and assays were run in a 7900HT Fast Real-time PCR System (Applied Biosystems, USA). The PCR conditions included an initial denaturation for 10 min at 95°C, followed by 45 cycles of 95°C for 15 s and 60°C for 1 min. Finally, a dissociation step included 95°C for 2 min, 60°C for 15 s and 95°C for 15 s. The final reaction volume was 10 µl and included 300 nM of primers. All reactions were carried out with two technical replicates (which showed no difference in expression levels). For each candidate gene sample (from five replicates), the ambient colonies at 19:30 were tested against the ambient colonies at 22:00 on the spawning night. A no-template control and a no-reverse transcription control were performed for each gene and treatment to ensure that the cDNA samples and PCR reagents did not undergo DNA contamination. Additionally, to ensure the specificity of the primers for the coral cDNA, they were tested on cDNA and genomic DNA from Symbiodinium sp. as a template in a PCR. This procedure avoided any amplification of non-coral DNA. The comparative delta CT method (Walker, 2002) and a maximal PCR efficiency for each gene (E=2) were used to determine the relative quantities of mRNA transcripts from each sample. Each value was normalized to two reference genes, adenosylhomocysteinase (AdoHcyase) and ribosomal protein L7 (Rpl7). The selection of reference genes for this experiment was performed using a pool of reference genes (Supplementary file 3) and analysing their expression stability via the geNorm software (Vandesompele et al., 2002). For this study, the most stable expression was found for AdoHcyase and Rpl7 (M value=0.225), and a minimum of two reference genes was recommended (V2/3=0.102). The real-time dissociation curve was used to check for the presence of a unique PCR product. Relative expression values for each gene were calculated by showing a ratio of the relative expression at 22:00 over the relative expression at 19:30. The results of the qPCR and RNA-seq analyses are presented on a log2 scale. A Welch t-test was used to test for significant differences in the expression levels (obtained via quantitative real-time PCR) of each gene at 19:30 compared with that at 22:00 (Supplementary file 3). Ninety healthy colonies of A. millepora (which were checked for maturity as described above) were transferred from the Heron Island reef flat and placed in the outdoor flow-through aquaria which was continuously flushed with seawater obtained from the Heron Island reef flat. Five colonies were placed into each aquarium, which were shaded during the day to simulate PAR levels at a 3-m depth. The coral colonies were acclimated to ambient seawater temperatures for 48 hrs prior to the experiment. At night, the shading was removed after sunset to expose the corals to natural moonlight. We simulated later ‘sunsets’ to determine if light intensity and light spectra can phase shift-spawning time. The coral colonies were divided between aquaria exposed to the light intensity treatments (n=15) and light spectra treatments (n=10); the coral colonies were divided into three aquaria for each of the seven treatments. The coral colonies were irradiated with artificial light every day for 6 hrs between 18:00 and 24:00 (midnight). These colonies also received the ambient light/dark cycle during the day. We tested three light intensities (100 [‘high’], 50 [‘medium’] and 0.75–1 [‘low-dim’] μmole quanta m-2 s-1 [using T8 fluorescent lamps]) and three light spectra (blue [400–500 nm, Lee filter model, deep blue 120 40% transmission], green [500–620 nm, Lee filter model, dark green 124 60% transmission] and red [620–700 nm, Lee filter model, bright red 026, 80% transmission]). The light intensity was adjusted to 1 μmol quanta m-2 s-1 for all three light spectra using a neutral density filter (Lee filter model, neutral density 210 (0.6) 20% transmission) when needed. The light was measured using a LI-COR (LI-192S) light meter. As a control, we maintained another set of corals that were exposed to ambient light/dark cycles. The corals were divided into four large tables; the first table included the control tanks, the second the ‘high’ light intensity treatment, the third the ‘medium’ light and the fourth table the ‘low’ light treatment corals. At the ends of each table, we added another four tanks into which were projected the blue, green and red light spectra. To avoid any light ‘leaks’, black plastic screens were placed between the treatments. The experiment was conducted on a roof deck at the Heron Island Research Station to avoid artificial light ‘contamination’ and increase exposure to moonlight when the corals were not artificially irradiated. The experiment began on October 31, 2006 and ended on November 15, 2006. The corals were monitored at night each day after the full moon (November 5, 2006); moonrise began at 17:53, and moonset was at 04:22 (November 6). Each night, the corals were monitored between 18:00 and 03:00 or until spawning ceased. The times when the gamete bundles appeared in the polyp mouths (‘setting’) were recorded, as well as the times at which the first and last gamete bundles were released into the water column. The data were analyzed based on the timing of gamete release. Spawning in the field for the same species was observed via snorkeling or scuba diving. The major spawning on the reef and in our control aquaria occurred on the night of November 13, 2006, which was 8 nights after the full moon night. After the spawning event on November 13, the corals were held in the aquaria and monitored for later spawning in the ambient light/dark cycles with no artificial light until November 15. At the end of the experiment, the coral colonies were returned to the Heron Island reef flat. PhD thesis, University of California, Santa Cruz. 133–207, Coral reef ecosystems, ecosystems of the world. Proceedings of the 5th International Coral Reef Symposium 4:307. Integrative and Comparative Biology 45:848–855. Marine Ecology Progress Series 227:241–251. 6th International Coral Reef Symposium 2 803. Philosophical Transactions of the Royal Society B: Biological Sciences 364:2849–2865. Proceedings of the National Academy of Sciences of the United States of America 110:7973–7974. Royal Society Open Science 2:150358. The Journal of Experimental Biology 214:770–777. BioEssays : News and Reviews in Molecular, Cellular and Developmental Biology 33:165–172. Proceedings of the Royal Society B: Biological Sciences 277:715–722. Proceedings of the 5th International Coral Reef Symposium, 4. Molecular and Cellular Neurosciences 31:399. Thank you for submitting your work entitled "Unwinding the mystery of coral broadcast mass spawning, signaling cascades and the importance of moonlight" for peer review at eLife. Your submission has been favorably evaluated by Ian Baldwin (Senior Editor) and three reviewers, one of whom served as Guest Reviewing Editor. One of the three reviewers, Peter Harrison, has agreed to reveal his identity. In their manuscript, Kaniewska et al. use experimental manipulations and transcriptomics to examine the signaling mechanisms underlying coordinated spawning of A. millepora. The authors provide evidence indicating that excessive light delays or prevents spawning. They also identify transcriptional changes during spawning that suggest molecular pathways that likely regulate spawning events. In conclusion, this is an important article that lays the foundation for future studies, including comparative studies with closely related species (2 acroporas, for example) whose time of spawning is different, and thus may allow finding the precise mechanism of time to spawning. The work is carefully performed and worthy of publication once the following revisions, indicated by the reviewers and outlined below, have been addressed. 1) The authors suggest that red light is the most important spectrum involved for sperm release. However, Gurbunov and Falkowski (2002) have suggested that detection of blue spectrum of moonlight could be the key to spawning. The authors should comment on this apparent discrepancy in the Discussion. 2) Figure 2—figure supplement 3 should be included in the manuscript. It is discussed in the text, represents a substantial experimental undertaking, and has important implications. This figure could easily be adapted to one panel by simply placing the blue line (phase shift) of panel B into panel A. A legend defining the shaded regions would add clarification. To include this additional figure, I think Figures 1 and Figures 2 could be consolidated into one figure, with one panel describing the changes in transcript expression during "undisrupted" spawning and the lower panel describing the changes in transcript expression following experimental disruption. I'm not sure that Figure 1 panel A (current iteration) is necessary. 3) Another interesting aspect of this study, which is not highlighted in the text, is that the results indicate that the disruption to spawning cycles is relatively rapid, such that within 7 days major changes can be induced. In contrast, some of the earlier studies suggested that moonlight rhythms might be entrained over at least a few months e.g. Willis et al. 1985. The authors should comment on this apparent discrepancy in the Discussion. There seems to be a misunderstanding, as we do not suggest in our text that red light is the most important spectrum involved for gamete release. 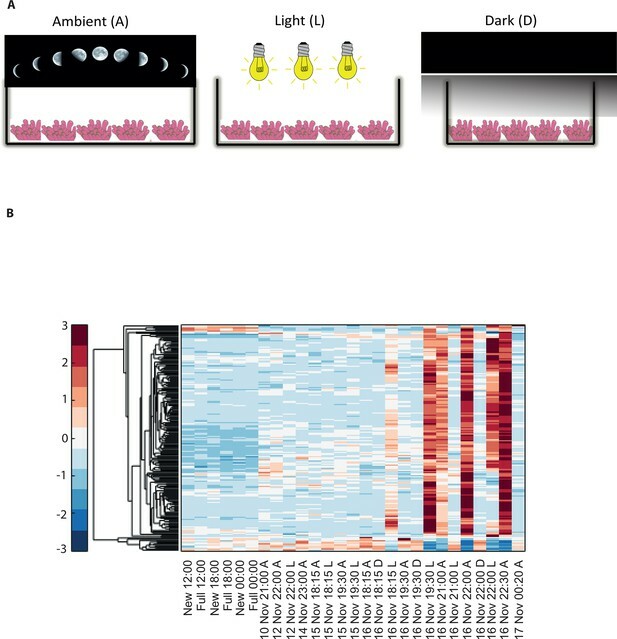 In fact, our results suggest the opposite, that blue light is important, which fits with what was suggested by Goburnov and Falkowski 2002, and a recent study which investigated A. millepora coral larvae settlement showing preference for blue and green light of the. We have clarified this in the text now and have also added the suggested citation. This text was revised accordingly, and we added the following passage: “Our results suggest that detection of light in the blue and green parts of the spectrum is important for gamete release, which is congruent with suggestions that blue light detection is a key element for coral spawning behaviour (Gorbunov and Falkowski, 2002) and evidence that A. millepora larvae settle more readily under blue and green light as compared to red light (Strader, Davies and Matz, 2015). Furthermore, our results from both experiments (Figure 2, Figure 2—figure supplement 3) on the effect of “light pollution” on coral spawning behaviour suggest that disruption or phase shift delay in spawning time can occur rapidly, that is, within 7 days of exposure to changes in nocturnal light regimes”. We argue that Figure 2—figure supplement 3 is better left as a supplemental figure as it describes a separate experiment that investigated the effect of light pollution on coral spawning behavior. If listed with the main figures, it might add confusion to the readers of eLife. The initiative of Figure 2—figure supplement 3 is only to support the partial finding of light pollution affecting the spawning. The supportive figure is describing a physiological experiment that was conducted during 2006-2007, and we are afraid it will be shadowing our main work from the 2011 experiment that includes physiological and RNseq sampling. However, if the editor insists on this change we will change this and include the figure as a main figure. As suggested, we have added a sentence to the Discussion describing the discrepancy between our results and that of Willis et al. 1985 (“These findings differ from previous studies which suggested that entrainment to moonlight rhythms occurs over several months)”. The authors thank A Tarrant for comments on drafts of the manuscript and Heron Island Research Station staff for their help during experiments. This work was supported by the Australian Research Council (PK and OHG). The sequencing data reported in this study has been deposited to the Sequence Read Archive (SRA), under accession SRP055723. The authors also thank Prof. P Harrison for his supportive review and the two additional anonymous reviewers in improving this manuscript. © 2015, Kaniewska et al.